Located in Mill City, Oregon, Frank Lumber Co., Inc. has a long history of manufacturing high-quality products. “The moisture content has to be at a certain level, so we rely on Wagner’s Model 683 in-line meter to kick out wood that doesn’t meet the end use standards for our customers,” Frank explained. Automatically measures the moisture content in every board, eliminating the disadvantage of just spot-checking. Automatically rejects boards which are too wet or too dry, identifying problem boards before they cause wet claims or manufacturing defects. Employs a display and marking system that is calibrated in percent moisture content, not meaningless units. Uses non-contact sensing to eliminate sensor wear. Has sensors that use electromagnetic wave technology to measure moisture throughout the wood, not just on the surface. Has accuracy that is not affected by humidity, ambient temperature, surface moisture, static electricity or sensor debris, eliminating recalibration and maintenance headaches. Uses Wagner’s built-in air-gap compensation for accurate reading of warped boards. 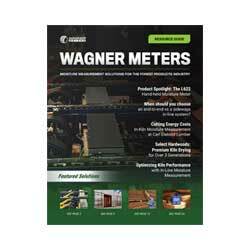 Frank Lumber Co., Inc. has a long history working with Wagner Meters. “We’re a company that likes to stay involved with technical standards related to wood,” Frank explained. “Our former Technical Director, Bill Galligan, and Ed Wagner (owner of Wagner Electronics) co-authored an ASTM Standard for the calibration of in-line moisture meters. Wagner Meters’ products have proven to be very reliable at Frank Lumber Co., Inc. Give us a call worldwide toll-free at (541) 291-5125 for more information on how we can help you too!